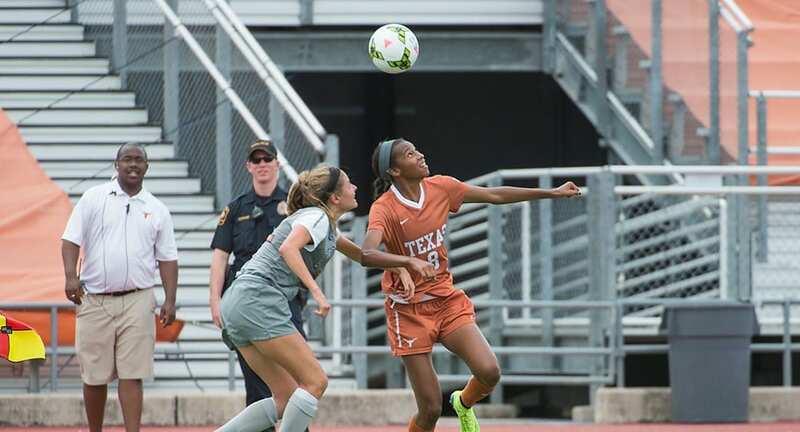 Forward Alexa Adams scored what turned to be the only goal Texas would need Saturday to help lift the Texas soccer team to a 4-0 win over Kansas State (photo courtesy of texassports.com). AUSTIN, Texas — It was Senior Day at Mike A. Myers Stadium, but it was freshman midfielder Julia Grosso who scored a pair of goals, the first two in her career, and junior goalkeeper Nicole Scurry snagging three saves en route to her fifth shutout of the season to lead the Texas soccer team to a 4-0 win over Kansas State. The win improved the Longhorns’ record to 13-2-2 overall and 5-2-1 against Big 12 teams; Kansas State fell to 4-11-2 overall, and 0-8-0 in games against Big 12 teams. Alexa Adams gave the Longhorns what turned out to be the only goal they would need in the 35th minute when she buried an assist from Cyera Hintzen, creating a 1-0 lead that would hold up through halftime. The assist was Hintzen’s Big 12-leading ninth of the season. In the second half, Texas got the insurance goal — three of them, to be exact. Grosso cranked home her first goal from the top of the box in the 68th minute; then, in the 75th minute, Grosso was at it again, dribbling from beyond midfield to score her second goal of the game. Both of her goals were unassisted, and came on her only two shots on goal in the game. Haley Berg closed out the scoring in the 84th minute, when she converted an assist by Atu Mshana from nearly 20 yards out. The Longhorns’ four goals were the most they have scored in a conference game since beating Iowa State by the same score Sept. 21, 2012. Texas has won 11 straight at home, and will close out the regular season Thursday at Texas Tech at 7 p.m. Thursday.